When we got our first look at the cycle track on SW Broadway one year ago this week, it was an exciting time. Mayor Adams had fulfilled one of his “100 day” promises and — after talking about it for nearly four years — we finally had our first, physically separated bikeway in the central city. Combined with new buffered bike lanes downtown (on Stark and Oak), we were off and running into a bold new era for our bike network. But what’s happened since then? Has the cycle track been a successful experiment? If so, are there plans to improve and/or extend it? What’s the current thinking from the City on separated bikeways in general? This one year anniversary seemed like a good time to ask those questions. Chris Monsere is an assistant professor at Portland State University. He’s the principal investigator on an evaluation being done on the cycle track to help PBOT decide how it’s working. Reached this morning in his office, Monsere said the evaluation is primarily survey-based. They’ve been asking people who drive, walk, and bike on Broadway a series of questions about it. Monsere is still tabulating results, but says one thing that’s “jumped out” has been concerns from people trying to walk across the cycle track. “From the pedestrian survey, I noticed mentions of cyclists not stopping at the red light.” (Note that these are T-bone intersections without motor vehicle cross-traffic.) In addition to the surveys, PSU is also using video footage in their evaluation. If the Broadway cycle track is a success and the Mayor’s office feels separated facilities are important, are there plans to improve and extend it? No. At least not right now, says Adams’ Chief of Staff Tom Miller. One issue that remains is whether or not the Broadway cycle track is a good demonstration to base future plans on. The location PBOT chose — SW Broadway from Clay to Jackson — lacks major features that need to be understood before more cycle tracks can be implemented downtown. These features include motor vehicle cross traffic (to assess right-turn and signalization issues) and businesses directly adjacent to the facility (to address what are sure to be concerns from the downtown business lobby about parking and customer access). PSU’s Ian Stude agreed that PBOT installed the cycle track in a “relatively safe location” for an experiment (in terms of its engineering and political difficulty), but he thinks a major driveway into a parking lot at SW College and the right turn where the cycle track ends at SW Jackson will give PBOT and PSU plenty of solid evaluation data. – Students frequently use it as a sidewalk or wander aimlessly into it when things are crowded. – At the southern end, I’ve had a few close calls with right hooks turning onto Jackson, since the track makes it all that much more difficult for motorists to see bike traffic around the parked cars. I’ve also made that turn a few times in a car, and it makes me nervous every time despite being hyper-aware. – When pedestrians cross the street without the right of way, they often hustle across the vehicle lanes and then step right into the track, unable to see cyclists due to the parked cars. So there it is, plain as day: For the city, separation = increase in riders. But since separation can’t be built everywhere in the city, I hope it’s accompanied by education in how to mix with traffic. Otherwise the city effectively will be attracting noobs and dumping them into situations that are over their heads. It just looks so temporary. Add a two foot wide strip of curb between the cars and the cycle track so it looks like you mean it. The thing that still drives me nuts about the cycle track is the approach to it, where cyclists are suggested to be (and to some extent required by law to be) to the right of right-turning traffic. It’s a terrible way to get into what’s a relatively nice (if not perfect) facility. 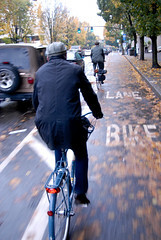 I walk up near PSU campus frequently and I never see anyone using the Broadway cycle track. Most cyclists seem to prefer the Park Blocks one block west of SW Broadway. I agree it is not perfect, but it does make my daily ride on Broadway feel safer than before it was installed. Inattentive peds are sometimes a problem for cyclists (a bell and establishing eye contact is useful) and cyclists who don’t observe or disobey traffic signals are a problem for pedestrians. Be aware, be predictable (i.e. observe the lights) and be courteous. I also ride on the Stark Street cycle track. It isn’t “protected” by parking, so sometimes inattentive drivers are in the bike lane, and more vigilance is needed by cyclists using this facility. I do like the space that the cycle tracks carve out of the street for us to use. They provide a level of comfort that a conventional bike lane doesn’t provide. I ride this daily en route to OHSU and have mixed feelings. While it’s nice to have the buffer between bike lane and traffic, I have to agree with Jeff’s comments: Pedestrians continue to be a problem (and I do stop at the red lights, thank you) and there are still right-hook dangers due to service vehicles entering the PSU campus. All in all, I vote “meh.” Kind of nice, but not the end-all in traffic management. I think the SW Oak St. bike lane is much clearer for cars and cyclists. I rarely get over there anymore but used to use it daily – through to March or so. Same issues with pedestrians and probably even more right hookers on the cars at the parking lots and streets as well as the cars that decided those ‘betweener’ sections at the intersections were great pull-outs for cell phone use or student pick-up/drop-off. General feeling after months of use was that it was a lot for nothing and I felt the visibility of the ‘typical’ bike lane was more safe. In the past two months I have seen some cars get into the parking lane behind a parked car and blare on the horn. It was quite amusing to see the driver and passenger honking and waving their arms at a parked car with no one in it. It was something uplifting to see after bombing my final. As for be a pedestrian and crossing the street towards the school, I always cross with a little caution since I don’t know what’s coming up on the other side of the parked car. I’m not assuming a bike is going through a red light but I’m more worried someone is going to go through it and turn left onto campus for either parking or to get to a building off of Broadway. They are usually at the “t-bone” intersection and the curb slants down in the middle of the intersection and not where the light is. Plus by not having any cars being able to go straight, the bikes are less cautious about making this turn. I haven’t heard of any accidents, so I guess it’s not a problem but it seems like it could someday. 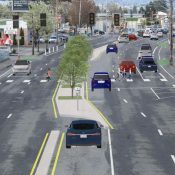 There’s a 2-way cycletrack planned for N. Williams? Only ridden it a few times, but it seems awkward and overly complicated. Also it is moderately uphill, so it would be nearly impossible to synchronize signals for cars and bikes. Hate to flog the horse, but if you guys had voted for me instead of Sam I would have come up with something better. That’s pretty laughable. Hang out next to any T intersection with a through bike lane and you’ll see cyclists regularly blow the light; the intersection of N Broadway and N Wheeler (the second light off of the Broadway Bridge heading eastbound) is an intersection where you rarely see anybody comply with the light. Cyclists are blowing these lights because they don’t think they have to stop due to the lack of cross traffic. Repositioning the signal is a waste of money. As for the the cycletrack, it’s got some pluses and minuses. The physical separation from traffic is nice, you don’t have to worry about getting doored, and because it’s not at sidewalk level there are fewer people who wander into the lane (though people still do use it). On the other hand visibility is an issue that might be difficult to overcome… I wonder how well right turns would work without resorting to something like a right turn arrow or similar. Overall it seems like a worthy experiment, and for this section of road it’s better than what it replaced. Jim Lee #13: Let’s say you’re running for mayor now, how would you have designed it differently? re comment 11, not two-way, no. actually nothing definite planned yet at all. they have put the prelim design work out to ALTA. I used to ride Broadway 2-3 times a week for classes at PSU. As others have stated, it seems very “temporary” which is another way of saying that it was a cost effective, but not perfect solution. If Portland had the money, it seems that a better solution would be to put the bike lane back on the left side of the parked cars with small curbs or “bumps” to provide some separation from both parked cars (and their doors) and moving traffic. I think the biggest issue (especially on Broadway by the hotels) is that the “door” and the bike lane are “shared.” If we could give bikes there own lane outside of the door area, things would be much safer. I love the idea of a Cycle Track all of the way from Cully (Where the new cycle track is being installed) to the Broadway Bridge or to the Burnside Bridge then down Broadway to PSU. THEN you will get to see how this “Experiment” works. Or you can just go to Copenhagen or Amsterdam and see now. Oh- I’d also like to see Jim Lee’s ideas. What are they? Oh I see them. I just prefer to ignore them as I cautiously roll through them. So far I’ve received no complaints (not even a frown). ..Or inch out into the street at intersections regardless of bike lane, or simply step off the curb pointedly refusing to look either way. spare_wheel: Here’s a complaint– Don’t roll through red lights. Anywhere. Do you “cautiously roll” through red lights when you are in a car? Of course not. Do you think cylists should have the same right to the road as cars? Of course we should. Is your behavior getting in the way of people thinking of cycling as a serious mode of transportation? Of course it is. I’m confused why people think Stude’s quote about the traffic light is funny or indicative of a character flaw in people who ride bikes. Traffic lights are engineered, designed, and developed for motor vehicle traffic. So, when a city experiments with putting a lane of bike traffic adjacent to the curb and puts parked cars adjacent to the bike traffic, I think it’s absolutely reasonable to be concerned that those people in the bikeway cannot see the signals as easily. It’s not an excuse to run them of course, but why mock the issue unless it’s just to further some stereotypical narrative against “scofflaw cyclists”? Jonathan, I think the posters are copping to the fact that many times when bicyclists are moving across the “T” we can see the red light (even if it is far to the left of us) and we choose to ignore it. It is rarely the case that bicyclists don’t “see” the light. It is one of those many instances that bicyclists are forced to follow the rules of automobiles even though the rule doesn’t really make much practical sense. I am all for “bike specific” signals, but they need to be implemented in a pragmatic manner that makes biking safer and more accessible to the public, rather than re-emphasizing rules for cars that don’t make much sense for bike traffic. In Amsterdam there are bike specific lights to carry bike traffic across difficult intersections. When the light is in effect, all auto traffic stops. This design probably inconveniences car drivers for the sake of bike safety. If we had bike specific traffic lights like that, I’d be all for it. I disagree that that’s why he’s saying that. He’s simply making a comment about something he has observed and heard people say about using that facility. i know people like to jump to conclusions and make that into a joke, but it’s really misguided, in my opinion, to do so. fact is, we need to make sure that people using our streets with bicycles are able to understand the signs/signals/etc… with the same ease and clarity as people in cars. At this time, it’s not as easy. The light may be for reasons other than allowing traffic to turn left across traffic, it can also be for pedestrian crossing. It’s something which I observe many bicyclists on my commute route routinely ignoring and forcing pedestrians (who are crossing with a walk signal) to take “evasive action” (stopping, stepping back, hurrying up) to avoid being hit by a bicyclist who’s running the red light. Intersections where this happens frequently are on Front avenue at Morrison and on Front at the new (wide) fire station crossing. 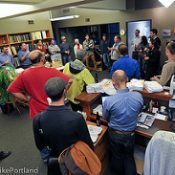 Are you really so isolated here on bikeportland.org that you don’t understand the perception of bicyclists by non-bicyclists in Portland and how that line might have been a way to charitably describe the behavior of bicyclists? I know that a lot of automobile drivers run red lights and roll through stop signs too but I don’t actually witness it that frequently when I’m commuting, I do witness bicyclists running red lights and rolling through stop signs *every* morning and evening commute. I ride to and from PSU every day. I don’t find the cycle track to be any safer than the old bike lane. I also find it to be an inconvenience as entering/exiting is harder than with the old bike lane and I hate the prescribed method for making left turns. Also, pedestrian traffic is a real problem on the cycle track. I would prefer a buffered bike lane. As it stands right now, if I’m planning on making a left turn at any point, I just forgo using the cycle track completely. @Brent: I hear you and I know exactly what you mean with regards to bikes and pedestrians on Broadway and Front. I suppose if we really have bike specific infrastructure, bikes would have yield signs in these instances (as well as most stop signs). Bikes should be giving peds the right of way, but when moving at a reasonable rate of speed, bikes also shouldn’t have to stop when moving across the top of the T.
Just give me a regular bike lane. If this was done anywhere else the right hook danger would terrible. As it is thc pcople going to and from parked cars makes this a poor concept. Zoomzit (#25) – Except in this case, the rules do make sense because of the pedestrian traffic at PSU, which will be crossing the cycletrack during the red light cycle. Jonathan (#26) – That doesn’t change the fact that it’s humorous to a lot of people, whether the remark was intended to be taken that way or not. The lights are in standard positions, it should be self-evident, unless people are confused because of the parking outboard of the cycle track. Also, since there is no “emotion” behind text, it’s very easy to read inflection into an account where none exists. I can see how some people can see it as a wry remark (or an indelicate jab) rather than as an honest statement. Zoomzit (#29) – Why not? They have right-of-way when the light is green. When the light is red, pedestrians on the perpendicular paths have the right-of-way. It’s the same situation as when a light is red and there is no car traffic on the crossing street – it’s still illegal to cross through the light, even when safe to do so. 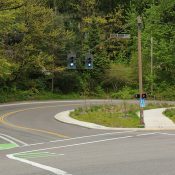 There may be examples of locations where running a red light on a “T” makes sense, (look at SE 17th Avenue at the entrance to Hwy 224 in Milwaukie, for example) but directly adjacent to a college full of pedestrians is probably not one of them. The lights are plainly visible, there might be a disconnect because of the car barrier (as in, this is a “separate street” and does not have traffic controls) or because there are other T intersections where it is much safer to run the light. As matt picio said, though, this is next to a college full of people, and there is ALWAYS pedestrian traffic. So don’t run over pedestrians, please. Still, it annoys me that PSU puts out little signs, saying stop here, while doing nothing to stop people from standing in the lane waiting to cross. Take a good bell with you, since school is starting up again. 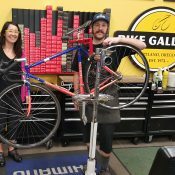 @ Matt picio (32): Matt, to be clear, when i used to ride down Broadway a few times a week, I stopped at every intersection (at the top of the T or not). However, I did this to strictly obey the law, not as an issue of safety. Fact is, you have to be keenly aware of pedestrians in this stretch because many are hanging out in the bike lane or crossing it against their own light. My point is this: If we actually designed “complete streets” that made sense for all modes of traffic, we probably wouldn’t require a complete stop for bicycles in instances such as this. Once upon a time I lived in Amsterdam and commuted by bike and recall that most separated bike facilities did not require stopping as you moved across the T and it worked just fine. Bikes yielded to pedestrians and everyone (bikes, cars and peds) were generally aware of their surroundings and proceeded with caution. A few simple improvements would go a long way. * White pylons between the cycletrack and parked cars. Those floppy plastic things. * A full white stripe between the parking lane and the driving lane. * “PARKING” stencils on each parking space. After there’s 10 cycletracks in town and most folks have seen them before, you won’t need extra marking. But to make the first one a better success, a little more paint would go a long way. I love riding in that cycletrack, hope to see lots more soon. Jonathan #23: The idea that cyclists are running the lights because they don’t see them is pretty damn amusing. As I mentioned earlier, I’d wager that if you parked yourself at any light-controlled T intersection in the city, you’d find cyclists on the through street running the red light. I even gave you a specific intersection (N. Broadway and N Wiedler) where you can see cyclists regularly run the red during the evening commute. The reason why we all laugh is because there are plenty of folks like spare_wheel (#19) out there. I can’t believe that you haven’t seen them before. I know A LOT of people do not comply with t-bone intersections and I also know why/how Ian’s quote could be seen as being funny. the idea Brent makes in comment 28 that I’m somehow isolated from “non-bicylists” perspective is really insane. I hear more from the non-bicyclists perspective than I think anyone in this city. I’m acutely aware of it in fact. – I’m well aware that a lot of people on bikes don’t stop at t-intersections. – i have specific theories/perspectives as to why it happens. – Ian Stude is a smart guy who was making an observational comment and wasn’t trying to give an excuse for running lights. – I have a sense of humor, but I don’t like it when people jumped to conclusions based on what i think are unfair stereotypes. Well, I kind of like the cycle track. There are always going to be things that require my attention – if it’s not peds, it’s delivery trucks or lunatics – so I take the obstacles in stride. At least in the case of the cycle track, people generally react quickly to the bell or holler and skitter out of the way because they understand I have the right of way on that track. That said, I do feel like a complete tool sometimes when I have to stop for a red light and wait, wait, wait before I get the green and can roll forward 2 feet into a green box and wait, wait wait through another red light to make my left. Something’s just off about that. I live near the south end of Broadway but I have never ridden on it. I walk across it with some regularity, so my comments are as a pedestrian, not as a cyclist. The biggest issue for me is that it’s unique. I’m not used to having bikes going by between the sidewalk and the parked cars. It always takes a little extra mental effort to wrap my mind around the fact that this is not the usual roadway with a bicycling facility. I strongly suspect that some of the problems are because others have the same reaction. Once we get more of these people will get used to seeing them and will understand better how to behave. I agree that more markings, signage, etc, should be implemented until then. I am not a VEHICULAR CYCLIST nor am I a SEPARATE FACILITY cyclist. I use either mode when opportunity presents. That said, my worst crash ever–the only time I have been hauled away by ambulance–was on a separate facility designed, built, and maintained by the imbeciles of Oregon State Parks. I had successfully avoided the INVISIBLE CHAINS they had strung across the path, only to be endoed by a double-bumper DOUG FIR ROOT in a shadow zone created by the same Pseudotsuga Taxifolia out of bright sunlight. I mentioned this to Rick Potestio a couple of years ago, and he remarked that his worst crash had been caused by a SIMPLE POTHOLE on a street poorly maintained by our WONDERFULLY PROGRESSIVE CITY. Michael Jackson aside, Rick and I agree that facial surgery is an abominably painful procedure. So on issues of BASIC SAFETY I am very VC. Motorists abhor potholes as a nuisance, but they are absolutely dangerous to cyclists. Green paint is nice, but smooth and well maintained streets are much more important to us. Best of all, smooth streets give us a common interest with motorists. More to follow. Watch your ballot in a couple of years. Just a stupid “feel good” statement by the city which is now giving us rails to crash on everywhere in the city. If you can’t ride a bike on a regular bike lane in downtown, you shouldn’t be on a bike. Do the genius’s at the city think that your average “bike mom” needs a track to ride on but is going to negotiate all the train rails they are now putting in the streets all over the east side? 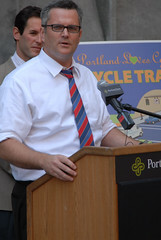 BikePortland should know better, but continues to prop up this fraud we have in office. I’m well aware that a lot of people on bikes don’t stop at t-intersections. have a sense of humor, but I don’t like it when people jumped to conclusions based on what i think are unfair stereotypes. Is it an unfair stereotype if it actually happens (per your earlier statement)? It’s silly to think that light placement is the issue on this particular stretch of road when the same behavior occurs at other intersections where light placement isn’t an issue at all. comments I made a year ago still apply today. The cycle track is confusing for pedestrians. Inexperienced cyclists who are supposed to benefit from this project have to ride over streets which require a lot of experience. And the $80,000 to build it would have been better spent elsewhere. Jim Lee @41 makes this point, too. My current favorite project that should have been funded but wasn’t was pre-emptive mowing of the blackberries and other weeds growing into the bike lane, such as on Capitol. Here are links to youtube videos of what I’m talking about. Regarding Ms. Ciarlo’s comment, “At this point, I have not gotten any negative feedback on it….”: I sent the City Council and the Mayor an email with my objections to this project and how the money should be better spent elsewhere, on 9/1/2009. I heard back from a couple of the commissioners, so I know the email got through. Perhaps Mayor Adams forgot to forward it to Ms. Ciarlo, but I doubt it. Awww just roll through — its liberating. And to all you LOTs, It is very insulting for you to presume that I fail to respect pedestrian traffic. The main problem on the cycle track is not cautious roll throughs but pedestrians jumping into the cycle track or running across the road at high speed. I could legally zip by at 20+ miles an hour but I choose to ride the cycle track very cautiously. I care more about SAFETY than respecting some silly car-centric traffic light. i personally do not want to see general fund dollars wasted on environmentally destructive transportation. i would also like to see motor vehicle operators pay their own way (gas taxes and vehicle registration receipts are not cutting it). You’re right, it was pretty “insane” to think and then say that you may be out of touch or isolated as it relates to the perception of bicyclists, on further reflection I’m willing to bet you get more “feedback” about this than any other single person in Portland. So, given that you don’t seem to understand why people might find that line funny, it must be an underdeveloped sense of humor instead. More anecdotal evidence for this is that in my experience it’s only the humorless that have to proclaim that they really do have a sense of humor. But back to the cycle track! In reference to the leaves on the cycle track which can be slick and possibly dangerous, does the City or PSU have a way to sweep the track? Other than “by hand” (which I doubt would ever happen) A bike lane or cycle track like what’s been put on SW Stark and Oak(?) are next to the car traffic lane and a street sweeper can easily sweep them of debris, the Broadway cycle track seems like it might be inaccessible to a sweeper. Many still are not comfortable riding in bike lanes, so even more separation is added in the form of cycle tracks. Are these safer than a bike lane? Perhaps not, but they feel more comfortable, and will make more people comfortable with riding. I’d rather a future of 25% cycle share with ‘less safe’ cycle tracks, than a future of 5% share with standard bike lanes. The net benefit to society is so much greater. I ride this thing a bunch of times per day, seven days per week. The only ‘problems’ with this track are the ones that it’s designers were already told would be a problem. Taking away the MV lane has made auto traffic in the MV lanes insanely dense, and impenetrable. 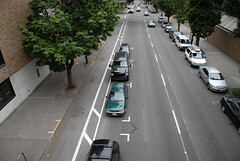 Because of the buffer, bicycle riders are FORCED to make unconventional turns on, and off, SW Broadway. All my life I’ve fought for access to these roads, and now I’m PHYSICALLY blocked from using this one, by cycling advocates no less. Thanks guys. Pedestrians simply have no valid complaint about this, and doing so really irritates me because pedestrians, most likely students, can’t see north on Broadway when they want to J-walk. So, when J-walking, it is imperative to get out into the track so they can see oncoming traffic over the parked cars. This track entices pedestrians to do this, instead of taking steps to prevent it. The result is that several times a day, the cycle-track gets so full of peds looking to cross Broadway, that it’s impossible to travel faster than walking speeds, during these times. This thing is unnecessary, and it’s a pain in the rear. Seriously, if cars going 13 mph threaten your safety, you are an unreasonable person whom shouldn’t be encouraged, or enabled. NF #48 – Yeah, and following the ridiculous laws, and policies, people like you jam down my throat is the safest way to avoid my ire. Just who are you taking what from NF? You’re not taking anything, you’re rudely, with mass entitlement, mass me-first, mass arrogance, riding your bicycle down the middle of the road, deluding yourself you are issuing some demand. You ain’t ‘taking’ anything, man. You’re just breaking the laws YOU want 90% of the time, being a poor ambassador which directly effects me personally, and in general just causing a ruckus. Safety? Good gravy people it’s a frickin’ bicycle! “T-bone intersection” is a good way to describe it, if it’s an intersection with a high incident of t-bone accidents. Better terminology (and what most everyone else uses) is just calling it a T intersection. Because that’s the shape it makes. Like a capital T.
I thought the “cyclists having trouble seeing the lights” comment was funny, and I read it as the commentor was making a wry statement. But now that’s it’s been described as being on the far side of the parking spaces and road from the cycle track, then yes, I can see how people would assume the light did not apply to them. Is there something wrong with putting a cycle track-specific light closer to the cycle track so cyclists can see that it applies to them? Besides the cost, that is. I haven’t heard other people say this, but I’ve been wondering how confining motor vehicle traffic to two lanes, down from three has effected motor vehicle density on this street. #49: I haven’t found that traffic is worse now that it is only two lanes. I often ride in the lanes there and, if anything, it seems like car speed has decreased which makes it safer for cyclists. It’s a mess wsbob. Wait ’til the Broadway is going full tilt boogie, again. That west lane of Broadway backs up clear into old town during peak, and on weekends. I’m not objective though, I always forget to disclose my bias when I’m railing on these things. Still though. Plus now the PSU Farmers market came off it’s chain this summer. The crowds are as big for it, as they are for Saturday Market. Whatever PizzaSchmiza has to do with organic farming, I’ll never know. Wow, how off-topic am I? Sorry J. One year later: the cycletrack is still a total failure. Broadway as a whole is more dangerous with all the cycling amenities than it would be as simply three or four regular lanes of traffic with some sharrows painted in the right lane (wait, correct usage of that marking? oh sorry…). The bike lane preceding the cycletrack is not for bikes, but for doors, cabs, delivery trucks, hotel valets and pedestrians. The cycletrack itself has one issue which trumps all others, and that is the lack of an escape route. If there is a slow cyclist ahead, someone parked in the cycletrack, passengers exiting vehicles, pedestrians blocking the lane, or anything at all in front of you, you have no where else to go. I don’t mind yielding or stopping to secure my safety, but leaving me with no where to escape in such a high traffic area is just plain dangerous. No right turns? That’s baloney too – look at all the parking lot that happens to be at the end of the cycletrack. I’ve almost been hit there on many occasions; only almost because I know it is dangerous and am prepared to yield to morons attempting to right hook me. If it weren’t for the direct connection to Terwilliger, I would never, never ride Broadway. That the city ever considered this design is a testament to how much of a joke our city’s traffic planners are. Do they even ride bikes, or is this crap generated by a magic 8-ball shaken in Amersterdam that has its picture taken and faxed here to good ol’ Portland? Seriously, we can do better. Much better. I ride the cycle track every day and just do not see the problems you mention. There is plenty of space to pass and pedestrians are learning to look for cyclists. The frequency of vehicles parked in the lane has also dropped sharply. I’d personally be happier taking the adjacent lane but IMO the cycle track is an unmitigated success. I don’t agree that pedestrians are learning to look for cyclists. I get just as many blank stares from people standing in the cycle track when I’m coming at them as I did when it opened. It’s not as if every pedestrian has been to that spot a hundred times before, it’s downtown and it’s at a university so there are a lot of visitors who have never seen the place before. I do think that Broadway needs a bike lane in this section because of the incline. However, I think the cycle track is misplaced because it just trades one problem for another and is fairly inconvenient to use. spare_wheel #56, there isn’t room, by half, to pass in that cycle-track, without riding dangerously close to other users. How do you justify doing this? Do you not observe the irony? ‘We’ just had to have that stupid thing because a bunch of folks have done real well with “I’m scawed”. You know, safety. Yet, here you are passing people in bike-lanes? Seriously? I know passing other riders is an affirmative defense for violating 814.420, but as others have pointed out, with a cycle-track design, you are banned completely from the highway. Know what that means? Consequence time. See, the consequence of being so inept you actually need this thing, is to wreck if for the rest of us with your selfish demands; and suffer our ire. If you are playing a game, and the cycle-track means to you less cars, and not safety, then the design may be inherently flawed, and slow us all down. I’ve seen you advocate for bike-lanes before, spare_wheel, yet you would give yourself a pass on the consequences of such advocacy. Word of warning. You might perhaps refrain from passing me, anyway, in that stupid cycle-track. I guarantee you that it will be decidedly unsafe. OK…you do have a good point. It *is* a limitation of our rights that we cannot take the lane to pass. I may need to rethink my support of limited access cycle tracks. 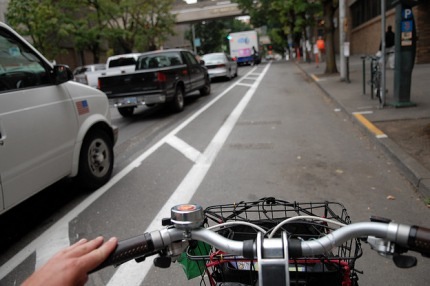 But practically speaking most PDX cyclists move to the right, giving me plenty of room to *slowly* pass them. I always thank them too. I do vehemently agree that current law preventing cyclists from riding in traffic when there is a dedicated bike lane is complete BS. I choose to disregard that law except at my *convenience*. I am sure you do too. footnote, people: the cycletrack is still an “experimental,” i.e., nonstandard treatment. therefore the mandatory sidepath law, 814.420, does not apply, because the public hearing exception at subsection (2) cannot be met. you are therefore still free to take the travel lane, which remains the sensible thing to do. plus one to comment 55 re the hotel and taxi lane from burnside down. again, the sensible approach is to take the lane, but here the statute does not protect you, unless maybe the lane widths are substandard. if the right travel lane is at least eleven feet wide and the parking lane is at least seven feet wide, the striped bike lane is probably legit, despite the hotel and taxi conflicts.